The Guardian describes Lisbon as ‘a place so beautiful you can’t believe people are using it to live in’ and we certainly concur. Behind its vibrant, tiled façade, though, is a history of conquest, disaster and dictatorship, and an uncertain future for its residents. Ranking: the biggest city in Portugal but miniscule by international standards! Date of origin: area inhabited since eighth century BCE, first fortifications of the castle date to the second century BCE. The name ‘Lisbon’ comes from the Phoenician ‘Olis Ippo’, meaning ‘safe harbour’. As with most port cities, its defining feature is its position – particularly in its role as the Westernmost port in Europe, closer to the New World than any other continental capital. Lisbon’s vital role in pioneering overseas trade routes and its enormous involvement in transatlantic trade in slaves and goods is writ large on the landscape. Of course, it’s nowhere near as opulent as Paris or as sprawling as London, but if you find yourself in the Praça do Comércio, for example, you can’t help but feel that this was a Very Important Place at one time in history. Lisbon’s urban landscape is also a window into many other, less glorious moments in its history, from the Moorish conquest (and Reconquest), to the 1755 earthquake which devastated the city and the subsequent rebuild. Whilst only a couple of the city’s neighbourhoods escaped unscathed, enough of the pre-catastrophe architecture remains that we can construct an idea of the old Lisbon. This is complemented by the first tremor-resistant construction, a grid-planned city centre which inspires many a comparison to Haussmann’s Paris (remembering that Pombal’s Baixo outdates the Prefet de Seine’s renovations by almost a century). How to thread together a route which ties in all of this incredible history, architecture and urbanism? Well, dear reader, I pinched it. Much of our route follows the city’s famous 28E tram which navigates a circuit across the city’s seven hills. Simply put, there is a reason why this is so popular with tourists – it enables the visitor to see a good chunk of the city and its principal sights. The other benefit for us is that you can replace sections of the walking route with a quick ride if needs be – rambling Lisbon is not for a walker shy of hills! The fact that something as quotidian as a public transport route has become one of the city’s principal attractions is testament to Lisbon’s charm as a city for all. There is no need to book tickets, queue for museums or tear your hair out at over-priced refreshments here (at least not yet). 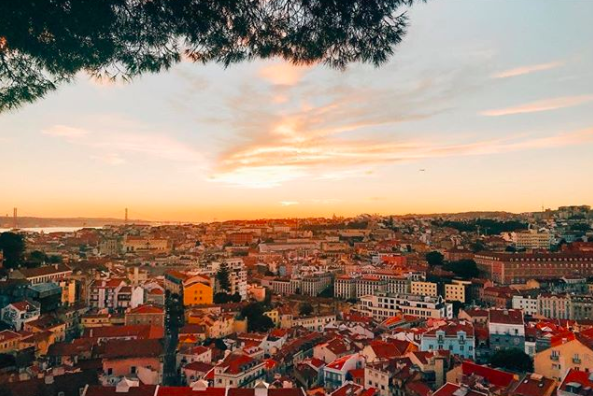 For the moment, Lisbon just about remains a reasonably-priced destination with enormous amounts to do and see, without putting an enormous hole in your wallet. 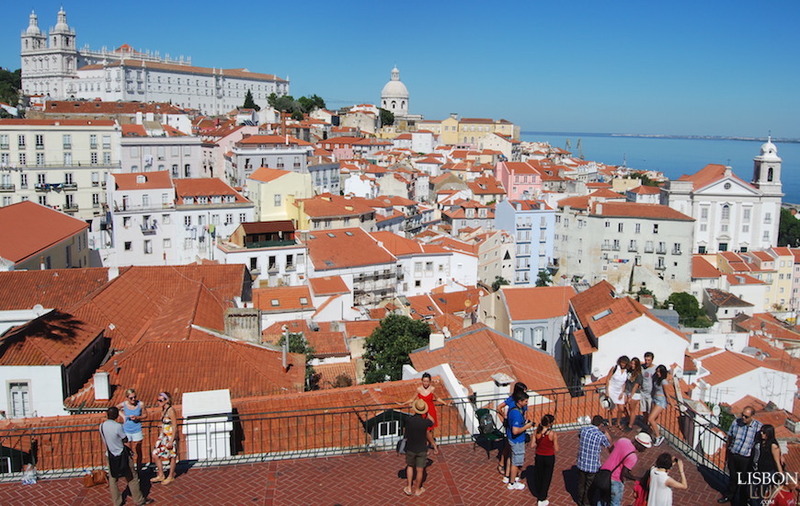 Nevertheless, Lisbon for Lisboetas themselves is grossly threatened by the creeping hegemony of Airbnb, meaning most of the locals you come across won’t actually live in the city itself. Our walk begins and ends in one of the more diverse corners of the city, and its disquieting to think that these populations, and the culture and colour they bring, will likely soon be pushed out of the centre. Our walk begins at Praça Martim Moniz, a gathering place for all sorts of people and nationalities; some embrace the diversity while others will think it is best avoided. Visually, the square is an intriguing mixture of a contemporary, cool, young scene, exemplified by rooftop bar Topo, and a slightly decrepit and disadvantaged feeling which pervades the down-at-heel market below. One is displacing the other, for better or for worse – gentrification is a theme at the front of the mind of every Lisboeta, and this square typifies it. The square is named after a knight who died in the 1147 Siege of Lisbon, in which the Christian invaders took back the city from its Moorish settlers in the Reconquista. Ironically, it is now a pretty multicultural place, with the Mercado da Fusão food market bringing cuisines from all over the world. The first neighbourhood we’re going to be exploring is Mouraria, which, as the name suggests, was originally named as a Moorish ghetto after the Reconquista. Its reputation as a district is one where people of different cultures have always got along (at one time, the city’s Jews were confined to the nearby Castelo locality), but where people stick to their traditions. Long-overlooked, the neighbourhood is beginning to be gentrified and receives increasing tourist footfall, threatening its idiosyncratic way of life. Throughout my week in Lisbon, there was only one bar I went into where the person serving me didn’t address me in English, and it was here in Mouraria. I found that rather charming. 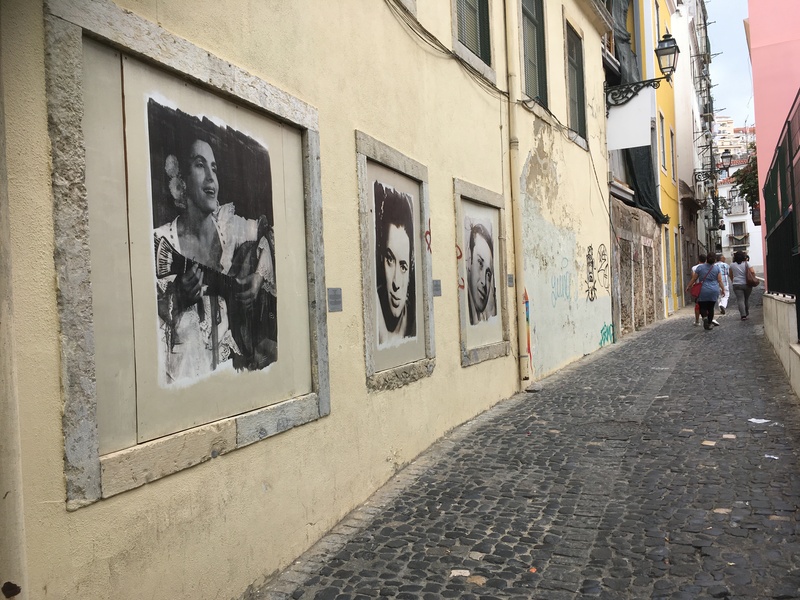 The neighbourhood is well-known as the birthplace of Fado, the quintessentially Portuguese genre of music. The very first fadista, Severa, lived on Rua do Capelão in the 19th century and the genre grew up from there. Nowadays, the street is an open-hour exhibition of photos of the most famous fadistas. Its songs are generally characterised by mournful tunes and lyrics, the subject matter of a lost love is associated with the absence of many Portuguese sailor husbands, and so it is particularly linked to the proleteriat. It was added to Unesco’s Intangible Cultural Heritage List in 2011. I had a quick peruse and was shocked to see that the UK doesn’t have any entries – if the art of making a decent cup of tea doesn’t qualify for the lists, then I don’t know what does! Heading upwards towards the Miradouro Sophia de Mello Breyner Andresen, and our first in a series of breathtaking views. The viewpoint sits atop one of the city’s seven hills – the source of much comparison with Rome, though the Portuguese capital actually predates the Italian by centuries. If you’re wondering who the viewpoint’s namesake is, Sophia (as she is more simply known) is a celebrated poet, the only woman to be honoured in the nearby Pantheon alongside fadista Amália Rodrigues. Like Amália, her poetry concentrated on themes of the sea, but also Ancient Greece, freedom and justice. “Poetry,” she explained, “is my understanding of the universe, my way of relating to things, my participation in reality, my encounter with voices and images. This is why the poem speaks not of an ideal life but of a concrete one: the angle of a window, the resonance of streets, cities and rooms, the shadow cast by a wall, a sudden face, the silence, distance and brightness of the stars, the night’s breath, the scent of linden and of oregano.” This Urban Ramble aims to reach such levels of evocativeness, but likely falls far short! We descend down into Alfama, which along with Mouraria was the only part of the city which survived the 1755 earthquake. For 3-6 minutes on the morning of All Saints’ Day, the world seemed to come apart as fissures some 5 metres wide were seen in the city centre. People rushed for open space for safety, and found themselves on the banks of the Tagus – which had itself disappeared. The sea floor, littered with lots cargo and shipwrecks was an omen of the destruction about to come – 40 minutes after the earthquake, a tsunami engulfed the harbour and downtown. To give an idea of the magnitude of the wave, historians and scientists believe the wave was felt in ports from Cornwall to the Caribbean. Parts of the city which escaped the tide were consumed with a fire which raged for days. In addition to the loss of a fifth of the population, the devastation to the city’s buildings was considerable. The city’s opera house, opened just six months previous, burnt to the ground, along with a lot of the distinctive 16th-century Manueline architecture. We’ll come to what replaced it later on in our walk, but for now, enjoy the ancient nooks and crannies of Alfama. 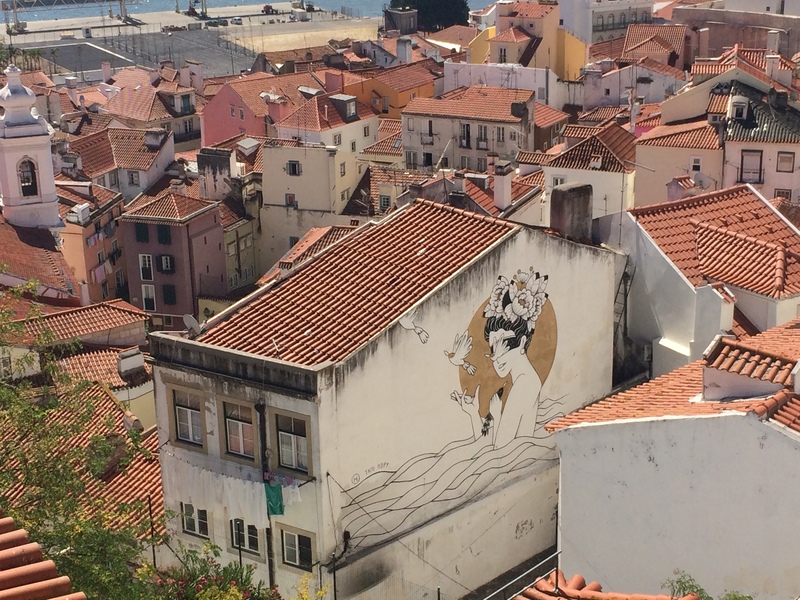 At this point in the walk, I would recommend putting your map away and wandering at will – as long as you keep heading downwards, Alfama always seems to bring you out at the harbourside. One good telltale for the route are the tracks of the 28E tram – for which, at some point you’ll probably have to stop and flatten yourself against the wall as it screeches past, threatening to take wing mirrors with it. If you’re rambling on a Tuesday or a Saturday, make a pit-stop at the São Vicente de Fora church and head under the arch to Campo Santa Clara, where the ‘Thief’s Market’ takes place. Now, I imagine the name holds true for tourists who are immersed in bargain-hunting and forget to keep an eye on their things – don’t be one of them! But enjoy the bargain-basement bric-a-brac – there’s treasures amongst the tat. I got a few shirts for a euro apiece! You’ll know when you’ve arrived at Miradouro Portas do Sol, as an incredible vista over Alfama and the Tagus opens up in front of you. Climbing the hills is undoubtedly worth it for moments such as these. On a sunny day – and Lisbon gets more sun annually than any other European capital – it’s a pretty buzzy place. On the day I visited, music was provided by a Cape Verdean trio. The patio jutting out towards the estuary has an almost open-air living room feel to it, with people dancing and romancing and children playing. Continuing down the hill, one of the unassuming whitewashed buildings to our right has a lot more history to it than meets the eye. The Museu do Aljube, a museum to ‘resistance and freedom’ is a former prison, used during the dictatorship which finished in 1974. For context, I’ve done a cursory Google search of what was going on in 1974 – Nixon resigned, Muhammad Ali beat George Foreman and Abba released Waterloo. In Urban Rambles terms, Camden Market was built, JG Ballard released his dystopian novel ‘Concrete Island’ about a central reservation on the Westway, and architecturally we’re coming to the end of the Brutalist movement. Now, for a person of my age these things all do seem very old but hopefully the effect it’s producing for you is that this was not that long ago. The museum’s five floors are a comprehensive and incredibly poignant exploration of the 48-year long dictatorship, and those who resisted and eventually overthrew it in an almost-bloodless coup. I thoroughly recommend a visit; whatever your level of familiarity with Portuguese history, it’s a fascinating place. 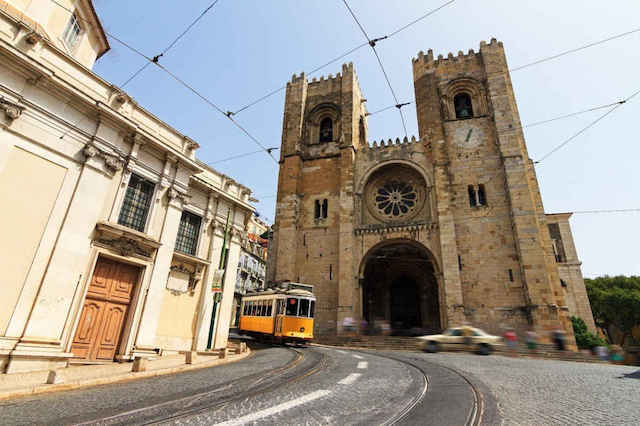 Just opposite is the imposing cathedral, the See of Lisbon – the oldest in the city, dating back to 1147. In its 870-year history, its seen numerous earthquakes and additions in various architectural styles. To its original Romanesque building have been added a Gothic cloister, a Gothic royal pantheon, crenellations from the period of the Reconquest, a Baroque sacristy and a rebuilt neoclassical and Rococo chapel. I wonder how many sailors’ wives have waved their husbands off at the harbour below and then come up the hill to pray for their safe return. We’ll walk this imaginary journey in reverse, down into the incredibly impressive Praça do Comércio. Tour guides will tell you it’s the biggest in Europe – it’s not – but you could certainly believe it. The light is unobstructed by buildings and reflects of the white marble in such a way that the sun seems to be shining particularly brightly here. Unsurprisingly, this grand spot was the location of the palace of the kings of Portugal – and is still colloquially known as ‘Terreiro do Paço’ (‘Palace Square’) though the palace itself was destroyed in the earthquake. In its place, the Marquis of Pombal (then Prime Minister) designed this enormous public space, looking onto the Tagus. 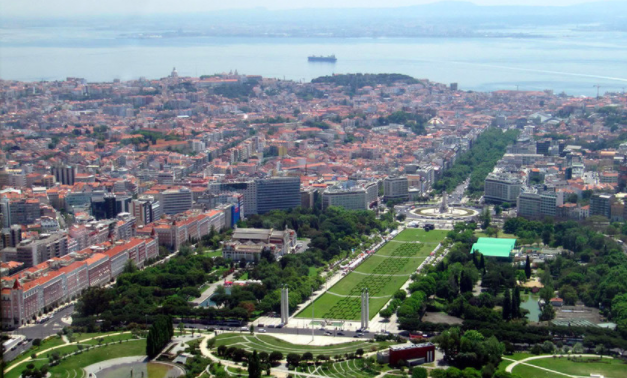 Its name – Commerce Square – pays homage to its new function in Lisbon’s economy. Of course, at this time, commerce meant colonial mercantilism, with goods being traded across all corners of the Atlantic and the profits coming back into the motherland via this plaza. The buildings lining the square were government bureaux dedicated to regulating the port and commerce between Portugal and its colonies, and one imagines the size of the square represents the importance of this trade to the Portuguese economy. Whilst the Marquis of Pombal ordered the rebuild, his architect, Eugénio dos Santos, deserves a good deal of the credit. He preserved the architectural memory of the destroyed Palace in the two towers at the ends of the arms extending towards the Tagus, but the undoubted centrepiece of his effort is the Arco da Rua Augusta. 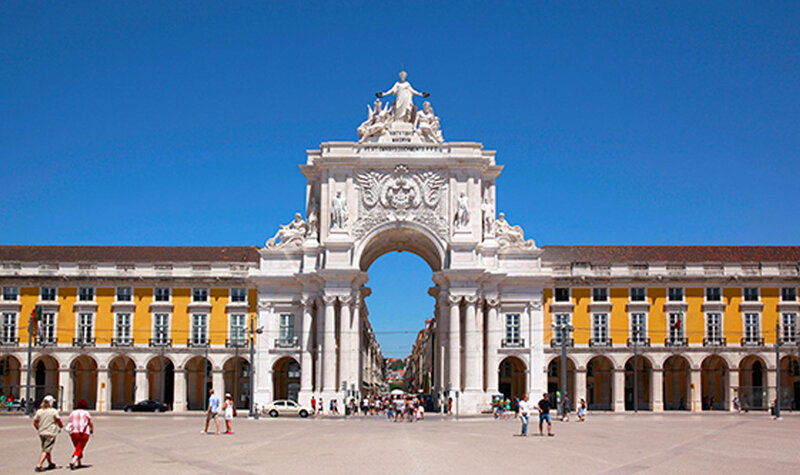 The arch – probably the most recognisable piece of architecture in the whole city – represents Lisbon’s triumph over the earthquake. The allegorical statues at the top were made by French sculptor Célestin Anatole Calmels and represent Glory, Valor, Genius, the rivers Tagus and Douro, and historical figures including Vasco da Gama and the Marquis of Pombal. The Marquis is probably one of the most important city planners in history, and in some eyes merits equal renown to Haussmann – especially considering the circumstances in which he undertook his grand project. In the immediate aftermath of the city’s destruction, he uttered the famous words: ‘What now? We bury the dead and heal the living’. The planned grid of the rebuilt Baixo district pays homage to his Enlightenment tendencies, with a standardised system of decoration – the usage of decorative azulejo tiles was much reduced in this part of town, and indeed the detail and amount of tiling depended on the importance of the street. In this era, the streets were occupied by tradesmen, each with their respective street, including: Rua do Ouro (Goldsmiths’ Street), Rua da Prata (Silversmiths’ Street), Rua dos Fanqueiros (Drapers’ Street), Rua dos Sapateiros (Cobblers’ Street), Rua dos Retroseiros (Mercers’ Street) and Rua dos Correeiros (Saddlers’ Street). The most important contribution this influential man made, though, was the first earthquake-resistant construction methods. These included the Pombaline cage, a wooden lattice within the building which distributed forces generated by tremors, and inter-terrace walls reducing the spread of fire. It’s intriguing to think that this kind of technology, architecture and city planning existed at a time pre-dating the French Revolution. In contrast to the colourful façades and ornate tiles on buildings in the area, you’ll notice the monochrome patterns beneath your feet in this part of town. Portuguese Pavement is one of the most recognisable motifs of Portuguese architecture, and one which has spread far and wide, most notably being used by Roberto Burle Marx on the iconic promenades of Copacabana and Ipanema beaches in Rio. As we head towards the other principal square of downtown, Praça Rossio, keep your eyes peeled for the elevador Santa Justa. It’s a glorious neo-gothic behemoth, dating back to a time when that wrought iron was both a construction material and an art form. It connects Baixo to the Largo do Carmo above, where we’re heading next. Indeed, you can by all means use it as a shortcut, though it’s got a bit of a reputation as a tourist trap – both for the €5 ticket and the numerous pickpockets who are known to operate there. The lift is said to be in the same style as the Eiffel Tower – personally, I put this down to the fact that it was built in the same material, in the same epoch (the tail end of the 19th century), and by an engineer of French parentage. It’s much more visually appealing than the so-called Iron Lady and indeed much more functional than Gustave Eiffel’s vanity project for the 1889 World Expo. 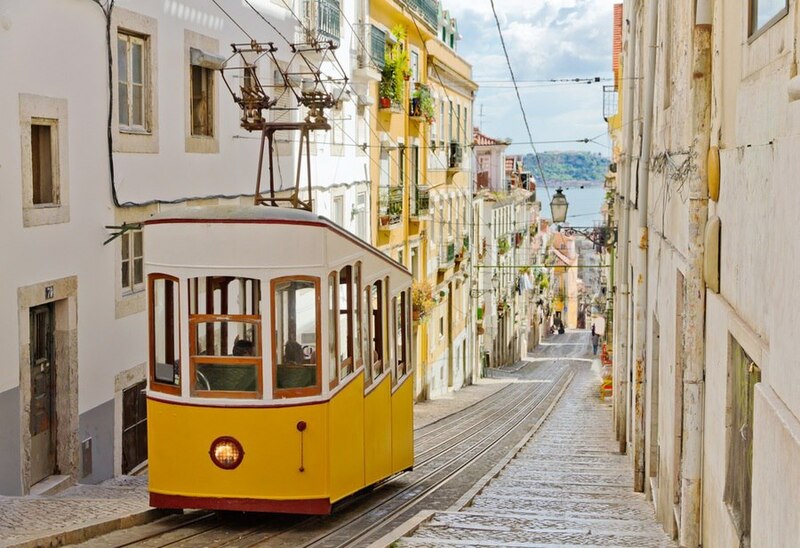 There’s something romantic about the lifts and funiculars that you find taking people from hill to hill in Lisbon, like the cable cars of carioca favelas or Singaporean islands. When public transport takes you literally into the clouds, it becomes more poetic than the usual prosaic, horizontal commute. At its summit is the Convento do Carmo, partially destroyed in the earthquake and left to loom over the rebuilt city below as a reminder of the tragedy. Building on its original plain Gothic structure began in 1389, and I find it incredible that it’s still such a fixture of the city’s architecture. Even despite the decision taken to preserve its semi-destroyed state, there’s been necessary renovations to stop it from falling apart completely. Surveying the structure, one feels that the city’s authorities have struck a good balance of sustaining the Convent in its ruinous state without letting it fall apart completely. This being one of the only buildings which semi-survived, it’s quite incredible to look at the interior and let the mind wander and to imagine what it must have been like to be in the city on that fateful day. A more cheerful scene which the Convent has withstood is that of the 25th April, 1974, when the dictatorship came to an end in this very spot. Military rebels encircled the last president of the Estado Novo regime, who was holed up in the garrison here. The coup became known as the Carnation Revolution after some of the rebel soldiers put these flowers into their gun barrels, but at most times of year the jacarandas steal the floral show up here, and it really is a charming little square. Carrying up the hill a little further, we come to the epicentre of Bairro Alto, the Praça de Camões, named for the statue of the greatest poet in the Portuguese language. The importance of Camões in the Portuguese imagination can’t really be overstated; just as we use Shakespearisms in our everyday speech, the Portuguese can all quote Camões at will, having learnt so much of his work by memory in their school days. His most famous work is the epic poem Os Lusíadas, oft-compared to the Aeneid. The work recounts the peregrinations of Vasco da Gama, who was the first European to sail round the tip of Africa. Previously known as the Cape of Storms, it was after this success that it was renamed the Cape of Good Hope, as we know it now. An impressive fella, I’m sure you’ll agree, and one most deserving of his celebrated role in Portuguese history. Anyway, I digress; back to the square. One of its more lovely contemporary features is the restored kiosk in the centre. Dotted all over Lisbon, the fin de siècle watering holes had fallen into disrepair until the one in the centre of this square was resurrected in 2009. Their restoration has become a it of a go-to story of urban regeneration in the media of late, a heart-warming example of how a little business dedicated to conviviality in urban spaces can do so much to improve the locale. Praça de Camões is a good mid-way spot to fuel up for the impending hill (well, hills are always on the cards here). The Manteigaria is known for its pastéis de nata (custard tarts) with some saying they’re better than the pastéis de Belém. A Brasileira café is an institution, akin to the Flore or Deux Magots in Paris, and famous for having been frequented by 20th century intellectuals, particularly poet Fernando Pessoa. The rich Art Nouveau décor is a feast for the eyes, even if the service might leave you a little hungry. Continuing up the hill to the summit of Bairro Alto, we come across the Bica de Duarte Belo, probably the most photographed of the funicular lifts. The framing of the colourful buildings around the Tagus below just make it too good of an opportunity to miss for the Instagram-obsessed amongst us. Indeed, the aesthetic appeal of the city is such that I wonder if this app alone has been a significant driving factor in the recent Millennial tourism wave. Just across the road is the20-somethings’ favourite watering hole, Park Bar. If you’re looking for a beer with an incredible view – and if you’re not, then I can’t relate – it’s worth a visit. It’s on the roof of a multi-storey car park just off Calçada do Combro. Following the tram down the hill, we descend from a part of town teeming with tourists and backpackers into a more elegant part of the city. The peace and quiet is presumably necessitated by the lofty work going on at the Assembleia da República, which we pass on our way up the hill. The Neoclassical Palácio de São Bento is certainly very impressive but your eyes will no doubt be drawn by the enormous face mural painted on a house to the side; the artist responsible goes by the moniker Drawing Jesus. The street art scene in Lisbon is really something to behold, and a large part of the charm of the urban landscape here. Eventually we reach the pentagonal Jardim da Estrela, created in the mid-19th century. It’s a beautiful spot to pause for a moment and take stock of all we’ve seen on our long, winding way so far. The variety of people enjoying the park is testament to its appeal, unsurprising since it contains numerous exotic plants, a small duck pond, a band stand and numerous kiosks selling refreshments. Just to the north is the Cemitério dos Ingleses, whose most famous resident is the playwright Henry Fielding (no, me neither). Leaving the park on Rua Santo Amaro, I’m afraid it’s up hill and down dale again. The prize at the top is the towering palms of the Jardins Botânicos, set on land which has been used for the study of botany since 1609. This is particularly intriguing when you consider that the first Botanic Garden in the UK was founded in Oxford in 1621 with the mission “to promote the furtherance of learning and to glorify nature”. We head directly to our next green space – its notable that all of Lisbon’s rus in urbe is spread out in a ring around the city centre, and therefore concentrated into one part of our route. The stimulating urban landscape of the inner districts is an architectural rainbow in virtually every colour but green. Still, it’s the work of an urban rambler to get off the beaten track! 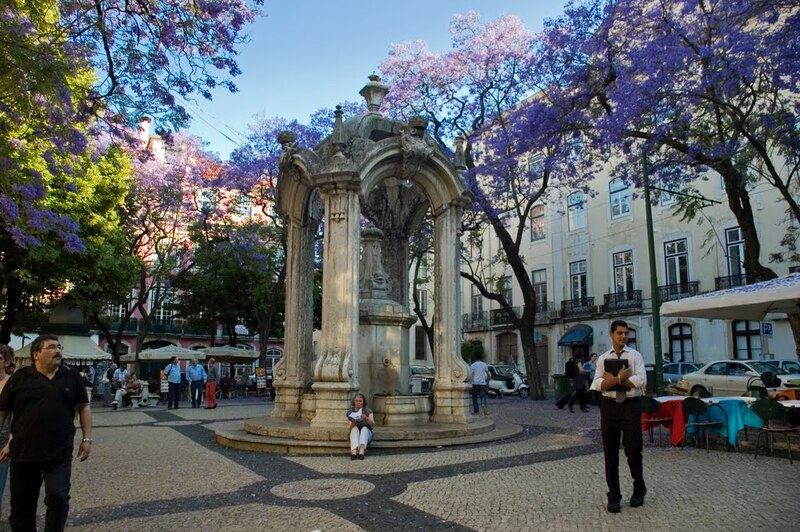 Our route takes us down to the Avenida da Liberdade, Lisbon’s principal avenue. This space used to be the Passeio Público, or Public Park. Somewhat of a misnomer, it was not publically accessible and instead a walled and gated park for the use of the upper echelons only. Nowadays, it doesn’t feel terribly different – it’s lined with designer boutiques, much like the Parisian avenues it was modelled on. Our next ‘garden’ is more of a viewpoint than a solid bit of green space, but I’m glad I stumbled across it nonetheless. The Jardim do Torel gives us the opportunity to take a breather in the shade and look at the hills we’ve just come from. Whilst usually a serene spot, each August the garden is turned into a beach and the mermaid statue into a pool – I could have done with that on the sweaty September day that I climbed up here! If you don’t think you’ve got another hill in you, you can always take the Ascensor da Lavra – the city’s oldest funicular – up here. The view won’t look quite as good though. The garden is an annex of the Campo Mártires da Pátria, which has seen many uses in its time. It was first a bullfighting ring in the 16th century, then the site of the Feira da Ladra flea market, and then a vegetable market by the mid-19th century. On the day I visited, it was really the most bizarre sort of hippy market – and who knows what will be going on when you see it! Such is the joy of our cities’ parks – like a theatre, they have different players and different scenes each day. Our final descent takes us towards another of the principal avenues of the Avenidas Novas quarter, Avenida Almirante Reis. On the map, it looks like a rigid ruler stopping the higgledy piggledy ancientness of Mouraria from bursting out into the valley. On the ground, you see that this is not the case – the street is buzzing with people of all sorts of origins going about their business. Keep your eyes up, though, because the avenue is lined with Art Nouveau gems in pale pastel azulejo tiles. Art Nouveau was a flash in the pan in Portugal’s architectural history, lasting from 1905-20 and only really concerned with façades. Well, given that that’s the only bit of the buildings one generally sees, it’s made a pretty big impact on the final strait of our walk. The Avenue is the subject of debate at present in the city, as an under-privileged, and ignored area and one of the last to be touched by gentrification. A thoroughfare in and out of the city, it used to be characterised by cheap hotels and the industry that attracts (read: prostitution). As such, Lisboetas are only just beginning to warm up to the idea of it as a hip place to hang out. It’s an appropriate place to finish our walk, as one of the last remaining examples of what is to be lost as Lisbon hurtles towards a future marred with gentrification. The city’s faces and façades are some of the most colourful in Europe, but disruptors such as Airbnb threaten its unique character. Hopefully this Urban Ramble will encourage visitors to get off the beaten track and enjoy the city’s past and present selves, without whitewashing its future. Between two orange-y biege buildings you’ll see a narrow alley climbing upwards, take this up to Rua dos Lagares, turn right. Shortly after, you’ll see a set of stairs, take these up to Miradouro Sophia de Mello Breyner Andresen. Cross the little park towards the turquoise and terracotta-colour tiled buildings, and take the street between them. The street will curve off down to the left, before meeting Rua do Voz do Operário (there’ll be pastel pink buildings in front of you). Turn right and follow it until you reach an imposing white church on your left. At this point, you can explore the church and Feira da Ladra (on Tuesdays or Saturdays), before picking back up the route. We’re following the tram tracks downwards to Miradouro Portas do sol. From here, we follow the tram tracks all the way past the cathedral and church of Santo António into Baixo. When you meet Rua dos Fanqueiros, turn left and follow the street until you meet the enormous Praça do Comércio. 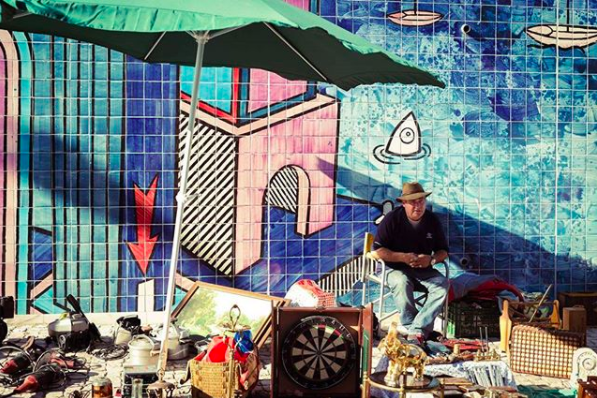 Explore, and then head underneath the archway (you seriously can’t miss it) along Rua Augusta. Continue for seven blocks, or about 500m, until you see the gothic Santa Justa lift to your left. Walk towards it for two blocks and then turn right again into Praça Rossio. 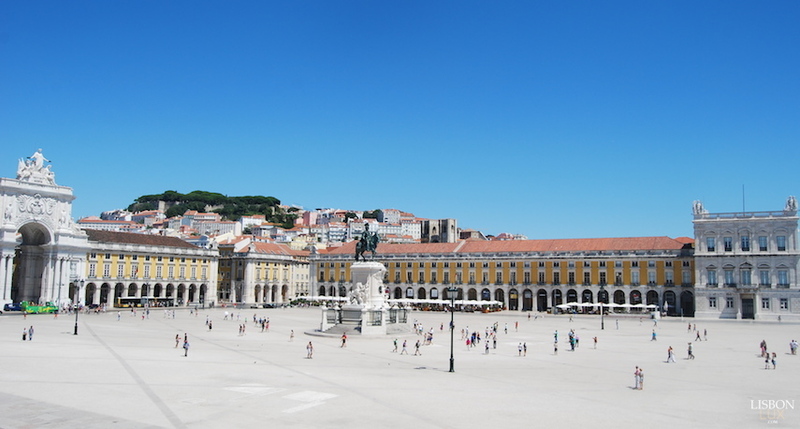 Strange as it sounds, go into Rossio train station and take the escalators up – your legs will thank you for it. You’ll come out of the station on Calçada do Carmo and continue zig-zagging upwards – the street you need is narrow, with steps cut into the pavement. You’ll come out into a leafy and lively square. 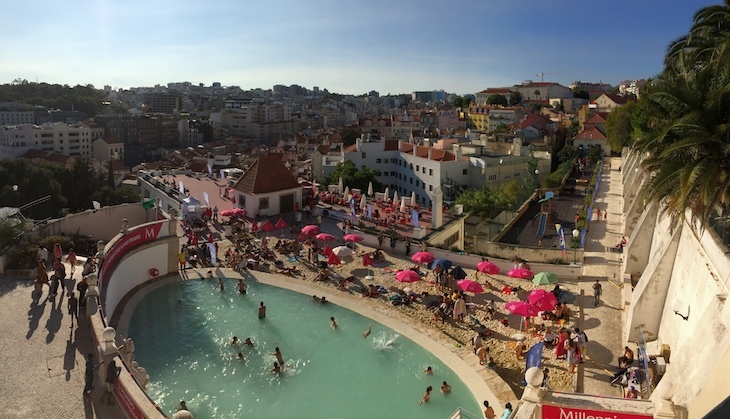 Cross it, and take Travessa Carmo – where the pink buildings are. We’re now following the tram tracks again. Continue bearing left until you reach Praça Luís de Camões. From here, we head up the main drag Calçada do Combro, as it becomes Rua Poiais de São Bento and then Calçada da Estrela. At its summit, keep an eye out on your left-hand side for the Elevador de Bica for an incredible view. As the road sweeps down into a fork, bear right – we’re following the tram all the way to Jardim da Estreia. When you see an ornate white basilica on your left, go through the gates into the gardens. 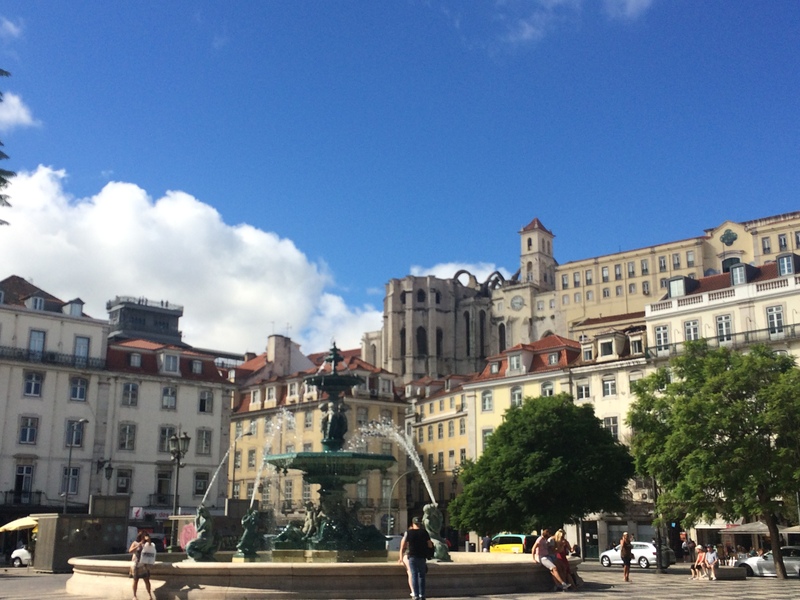 Come out of the gardens onto Rua de Santo Amaro – it has a more modernist yellow building on the corner. Head down until you reach Rue de São Bento. Turn left but then immediately right again, between a low-rise yellow building and a taller pink one. Take Rua da Imprensa Nacional to its summit, and you’ll see the Botanic Gardens’ lofty palms in front of you. Turn right and then, shortly after, left again onto the zig-zagging Rua da Alegria. At the fork with the yellow building, bear left, and then left again, until you reach Praça da Alegria. Cross the park and take Rua das Negras cross Avenida da Liberdade (the city’s main street). On the other side, you’re passing just to the right of the Michael Kors shop. When you reach Rua São José, turn right and then left again when you reach the Elevador da Lavra (tram lift). Walk (or ride) to the top and then turn left onto Rua Júlio de Andrade. Follow this street round, with the incredible views from Jardim do Torel to your left. Eventually, you’ll come to the Campo Mártires da Pátria. Cross it and take Paço da Rainha towards the Italian Embassy (look out for the flag). Take the road down to its right, keeping an eye on the pastel buildings. 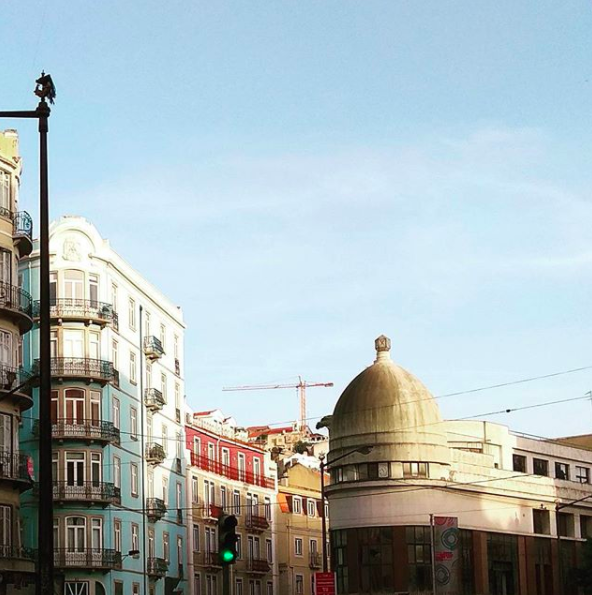 Take a right onto Rua dos Anjos and then a right again onto Avenida Almirante Reis. Turn right and follow the avenue back to Praça Martim Moniz. The Mercado da Ribeira houses offerings from all of Portugal’s top chefs – you’re guaranteed to be able to find something to the tastes of any hungry rambler! Park has become a real spot on the tourist trail, especially amongst backpackers and younger tourists. 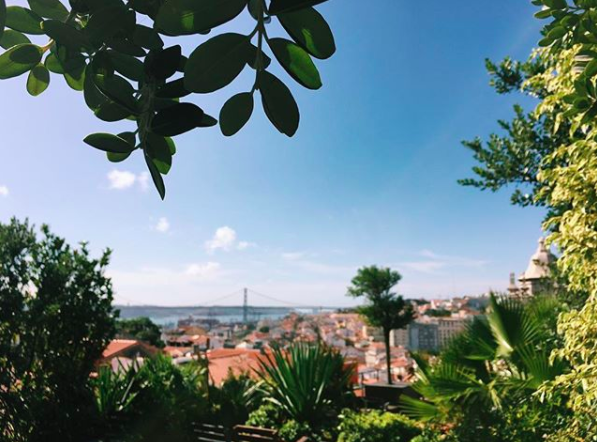 Nevertheless, the view is a sight for sore eyes of any age, and the burgers absolutely hit the spot after climbing the hill to Bairro Alto. Unless you’re feeling particularly groovy, I’d recommend going for lunch rather than later on, as it does get rather busy. I’ve included this as a pit-stop because it’s convenient, not because it’s necessarily a ground-breaking multicultural food market (some on TripAdvisor have apparently been disappointed). 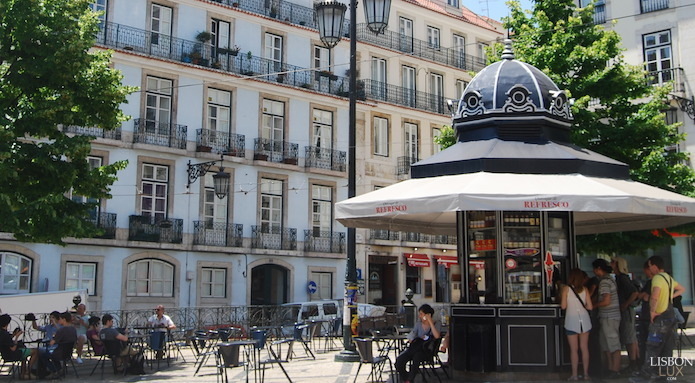 There’s about 10 stalls with good outdoor seating – good for a brunch to fuel up ahead of climbing Lisbon’s seven hills. Google bills it as a ‘historical industrial complex, housing an array of arty retailers & unique restaurants’. You could easily spend a day here and leave fed and watered, with a new tattoo, a new wardrobe, and an armful of indie magazines. Well worth a visit and not just enjoyable for the under-30s. Surprisingly big market full of vintage clothes, bric-a-brac, books and magazines, jewellery, badges and military paraphernalia, vintage postcards, just old… stuff! Definitely worth a visit if you’re in the city on a Tuesday or Saturday. The Aljube building, dating to the Moorish era, was a political prison from 1928 to 1965 and now houses a museum which explains the dictatorship and 1974 Carnation Revolution. It manages to explain a lot in a lucid way, and whether your knowledge of Portuguese history could be written on a postage stamp or fill a tome, it’s worth a visit. There’s plenty to keep you busy for a day in Belém, from the jaw-dropping opulence of the Jeronmios Monastery and its lush tropical gardens, to the twin monuments of the Belém Tower and the Monument to the Discoveries overlooking the Tagus, to the intriguing modern and contemporary Berardo collections. At some point, you’ll need to refuel – grab a seat at the back of the Pastéis de Belém shop (don’t queue) for an incredible portuguese custard tart and coffee.